For people with experience in yachting and the Greek seas, for those who sail for fun seeking the opportunity to explore new destinations living unique moments. For non- experienced people who wish to live unforgettable moments but also for those who can sail but wish to have restful “hop-on-hop-off” Greek island tours. For people who love sea and yachting vacations but have limited time or do not wish to spend all their summer holidays on a yacht. It is also recommended for special events services. The Catamaran Elvira has a spacious living space. Sit forward to enjoy the beautiful view of the Greece’s landscapes that you will visit since she is faster than other sailing yachts. Relax and enjoy the sun on the comfortable sun mattresses, dive into the blue sea from the swimming platform, or if you are lucky you might enjoy a company of dolphins playing along with you. We are a small family business that operates in the yacht charter market over the last 26 years. We are based in Marina Alimos but we also have bases in the Ionian Islands. Our primary goal is that people traveling with our yachts spend unforgettable holidays safely. This requires a unique service for each client, focusing on the specific needs as well as the maintenance of our yachts in the best possible condition. He is the founder, manager and company representative and the key person who will advise you for all possible issues you may face since he has been in the yacht market for 26 years. He is responsible for all requests and bookings and your contact for making your life easier as far as your request or booking is concerned. Will welcome you in our office, she is the administrative assistant and our office-based contact person. He is our base manager in Alimos, technical manager and the person who will help you during the check-in and check-out of your booking. 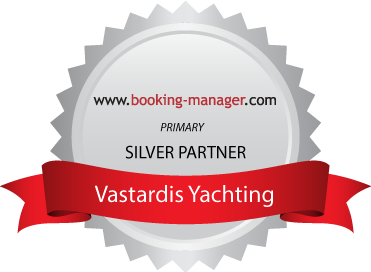 Vastardis Yachting is your partner for sailing in Greece. We provide high quality services.